Provenair® Series SN Stainless Steel Cylinders by ARO® Division of Ingersoll Rand are tie rod cylinders constructed of 303/304 end caps, tie rods, piston rods and mounts along with 316 Barrel. To maximize cycle life all have factory installed Teflon® wear band on piston. 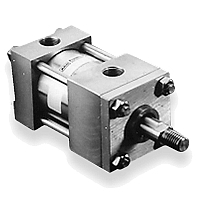 Bore size from 1½" thru 8"